Investments provides readers unparalleled access to the best in professional quality information on investment analysis and portfolio management. MICHAEL G. MCMILLAN, CFA, is Director, Ethics and Professional Standards in the Education Division of CFA Institute. Dr. McMillan joined CFA Institute in 2008 after more than a decade as a professor of accounting and finance at Johns Hopkins University's Carey Business School and The George Washington University's School of Business. He has a doctorate in accounting and finance from The George Washington University, an MBA from Stanford University, and a BA from the University of Pennsylvania. Dr. McMillan is a member of the CFA Society of Washington, DC and the East African Society of Investment Professionals. 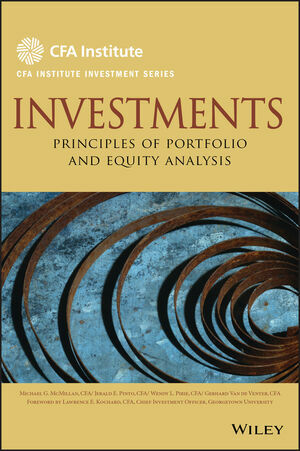 JERALD E. PINTO, CFA is Director, Curriculum Projects, in the Education Division of CFA Institute. Before coming to CFA Institute in 2002, he consulted to corporations, foundations, and partnerships in investment planning, portfolio analysis, and quantitative analysis. He has also worked in the investment and banking industries in New York City and taught finance at New York University's Stern School of Business. He holds an MBA from Baruch College, a PhD in finance from the Stern School, and earned his CFA charter in 1992. Chapter 1 Market Organization and Structure. 2 The Functions of the Financial System. 8 Secondary Security Market and Contract Market Structures. Chapter 2 Security Market Indices. 2 Index Definition and Calculations of Value and Returns. 3 Index Construction and Management. 4 Uses of Market Indices. 7 Indices for Alternative Investments. 2 The Concept of Market Efficiency. 3 Forms of Market Efficiency. Chapter 4 Portfolio Management: An Overview. 2 A Portfolio Perspective on Investing. 4 Steps in the Portfolio Management Process. Chapter 5 Portfolio Risk and Return: Part I. 2 Investment Characteristics of Assets. 3 Risk Aversion and Portfolio Selection. 5 Efficient Frontier and Investor's Optimal Portfolio. Chapter 6 Portfolio Risk and Return: Part II. 3 Pricing of Risk and Computation of Expected Return. 4 The Capital Asset Pricing Model. 5 Beyond the Capital Asset Pricing Model. 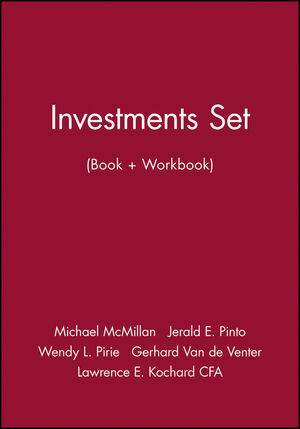 Chapter 7 Basics of Portfolio Planning and Construction. 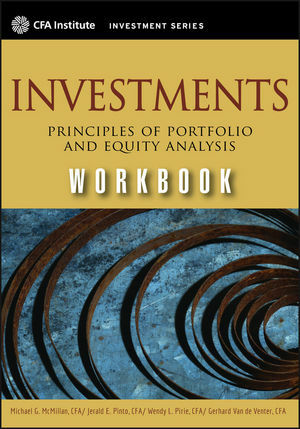 Chapter 8 Overview of Equity Securities. 2 Equity Securities in Global Financial Markets. 3 Types and Characteristics of Equity Securities. 4 Private versus Public Equity Securities. 5 Investing in Non-Domestic Equity Securities. 6 Risk and Return Characteristics of Equity Securities. 7 Equity Securities and Company Value. Chapter 9 Introduction to Industry and Company Analysis. 2 Uses of Industry Analysis. 3 Approaches to Identifying Similar Companies. 5 Describing and Analyzing an Industry. Chapter 10 Equity Valuation: Concepts and Basic Tools. 2 Estimated Value and Market Price. 3 Major Categories of Equity Valuation Models. 4 Present Value Models: The Dividend Discount Model. Chapter 11 Equity Market Valuation. 2 Estimating a Justified P/E Ratio. 3 Top-down and Bottom-up Forecasting. 2 Technical Analysis: Definition and Scope.